An up close view of alligators at Gatorland. Driving by Gatorland earlier this week, I was happy to see the parking lot FULL! And why not? It is a great time of the year to visit this Central Florida attraction. You’d never know there was a fire in November 2006 that destroyed the gift shop and Godwin family home where Gatorland was born. A simple roadside attraction in 1965 now features over 19,000 square feet of retail, meeting and office space, pavilions and of course, the historic gator mouth entrance. This 110-acre theme park and wildlife preserve has lots of alligators to watch and observe, but they also give visitors a chance to see white alligators, crocodiles, snakes, flamingos, parrots and a barnyard full of critters. Besides, where else can you watch a man wrestle an alligator? What I adore about this attraction is that it is not a high-tech flashy experience. It is educational, entertaining and “real.” The self-guided tour through Gatorland’s Swamp Walk gives visitors a glimpse of what much of Central Florida looked like many years ago – an unspoiled native Cypress swamp. It is nothing short of beautiful. 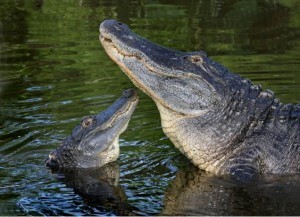 The “Alligator Capital of the World” is running a Florida Resident Special March 13 – May 2, 2010. Any resident ticket is only $9.99 (adult or child). If you are not a Florida resident, you still don’t have to pay full price. Seniors (55 & up) who visit before May 2 also get in for $9.99. 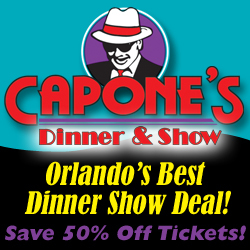 You may also download their coupon and save $2.50 off any ticket. The best deal is for Central Florida teachers; they (and a guest) get in for FREE! If the discounted price isn’t enough, for the next few weeks, random prizes are being given away to guests that include a chance to feed the gators, drive the train and more! Plan a trip to Gatorland. Walk through the mouth of the alligator and be pleasantly entertained by some of the fiercest creatures that live in the wild here in Central Florida. You’ll most likely learn something you didn’t know AND have a fond vacation memory for a lifetime. CityWalk’s Rising Star Could be You!